My nerves aren’t what they used to be. After I picked up my phone from the floor, my first inclination was to say, “An equation that will do what?” Instead, I gave a small, imperceptible sigh. Burying my head in the sand? Not at all! I'm looking for signs of earthworms, tunnels, castings and loose, moist topsoil. It's a fascinating world down here, check it out for yourself! If you find me in the field like this, don't worry... I'll be on my feet again in a half hour or so. Earthworm castings, after a heavy rain. Before I became a grass-farmer, I'd see these little globule-shaped piles of dirt, and wonder what made them. The earthworms come up at night (when predators are less likely to spot them) and eat whatever they find on top of the ground. This is their amazing fertilizer... our fields are covered with it. Nothing gets me quite so excited as fresh earthworm poop. Known as ‘castings,’ earthworm doo-doo is nature’s perfectly balanced fertilizer, a water-soluble mixture of dirt, vitamins and moisture specifically adapted to the pasture where they are deposited. Fields with healthy amounts of earthworms (say, a couple dozen per shovel full) will be festooned with these little piles of poop. This is free fertilizer that the grass can easily utilize for future growth. In a world of pesticides, chemical fertilizers and diesel powered manure flingers, earthworms are an amazing, free resource. On our farm, every decision we make takes earthworms into account. Although hugging them only ends up in a squishy mess, they are truly a farmer’s best friend. Nothing sounds as exciting as… watching the grass grow. But for a free-range farm, it’s of vital importance. By keeping grass in front of our animals year round, we grow food that requires virtually zero human or mechanical energy. Furthermore, by giving the grass the proper time it needs to flourish and recuperate, we build root strength, create deeper soils, retain critical moisture, and improve habitat for our earthworm buddies. This field was cropped for decades before we converted it to grass full time. Although it looks abundant, most of our fields are much thicker than this. Given enough time, the land will restore itself. It all takes time, good management, and patience. Patience?! We don’t have time for that! Can’t we speed all this “free-range” stuff up? You know, some organic chemicals here, some heritage breed genetic modifications there. Voila! Free-range drive-thrus from coast to coast! Not so fast, fast foodies. Let’s take a moment to remember our recent history. For generations, agricultural practices of plowing, combined with chemical fertilizers and herbicides, have compromised our soils. Add in nutrient-draining crops such as tobacco and cotton, and the picture becomes even clearer. Erosion, exportation of organic matter, and habitat destruction have been the agricultural norm for hundreds of years. Remember how important our little friends the earthworms are? Now, imagine sitting in your living room as a huge blade cuts your house in half, and herbicide is dumped on your head. You’d probably have a word to say at the next HOA meeting! In short, our dirt has been treated like… dirt. When I arrived back at my farm fifteen years ago, we didn’t have so much as a centimeter of top soil left. Rebuilding top soil, the rich upper layer of dirt where moisture collects, leaf matter decomposes and earthworms stir it all up, takes looooooong time. How long? To put it in perspective, I used 7 o’s in looooooong. As a grass farmer, it often feels more like forty seven. The good news is, just like boosting earthworm habitat and managing solar energy, patience is free. Sensing a common theme, yet? 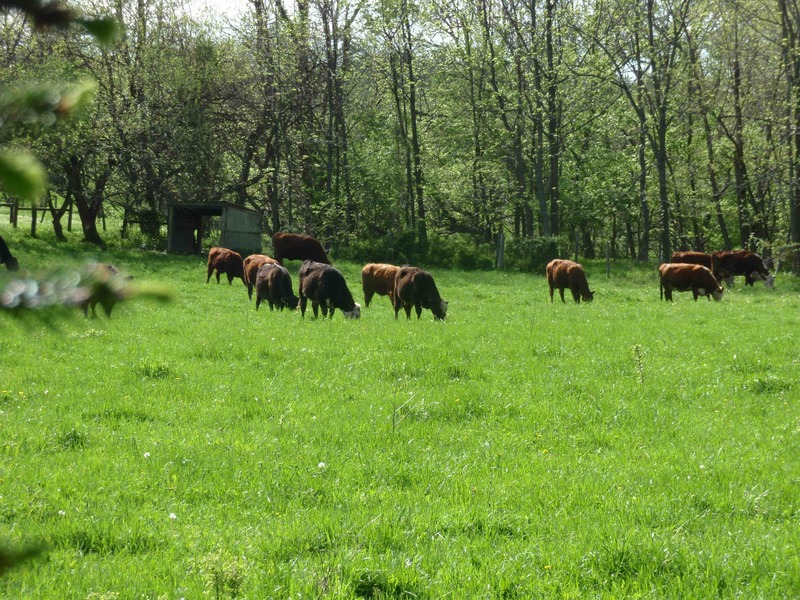 On our farm, it takes two full years to properly finish a grass-fed beef. If that seems like a long time, consider it another way: it’s the appropriate amount of time. Without proper variables in place, patience included, then we’ll never have a successful farm, regardless of the mathematical equation. I shrugged. On days like this, I’m especially happy to be a grass-farmer, free from term papers, all-nighters, and chug! chug! chug! fraternity parties. Like most things in life, knowing where we’ve been helps us to better decide where we’re going. Agriculture, I’ve learned, is certainly no exception. Check out my books, all about food, farming & living the good life! Growing Tomorrow (with 50 recipes!) is NOW AVAILABLE, and Gaining Ground is a New York Times bestseller. Guess you really shocked that college student. Thanks for being such a good steward of the land! Wish we had more farmers like you!!!!! I work with a guy that does urban composting. He refers to worms as livestock. Hey Phil! That’s a GREAT way to regard them. Of course, we’ve all been taught to only appreciate things when we’re able to associate a monetary value to them. This kind of language can really change people’s thinking. Have you written any articles on being a grass farmer? My girlfriend and I have recently started raising Black Mulefoot pigs and I want to be able to restore the pastures that have not been managed well for many years. The Horses, Pigs and Chickens are all Organicly fed now…but I really want to provide them with the very best grass to eat from spring to fall. 1) Be patient. It only takes a year or two of bad management to ruin an otherwise fertile farm. Centuries of clear cutting, tillage and planting of heavily demineralizing crops (tobacco, especially) have reduced our fertility to all-time lows. The frustrating part of being a farmer is that is only took a short time for our forefathers to do damage, but it’s going to take us lifetimes to rebuild what they (mostly unintentionally) squandered. 2) Maximize ‘free things’, and avoid costly inputs. What is free? Sunshine, rain and air (carbon, nitrogen, etc.). What is costly? Machinery, fuel, employees, electricity, medicine… you get the idea. While these two philosophies must sometimes intersect, try to solve problems with the first group, not the latter. Combine ‘free-things’ with patience, and chances are you’ll be on the right track. Good luck, and stay in touch!